This post is sponsored by Nordstrom, all opinions are my own. Fall has came and now we are preparing for winter. I can’t believe that it is already time to start thinking about cozy sweaters, cardigans to layer, and keeping warm. Wasn’t it just the start of summer time? I will say, dressing for fall and winter is my favorite. 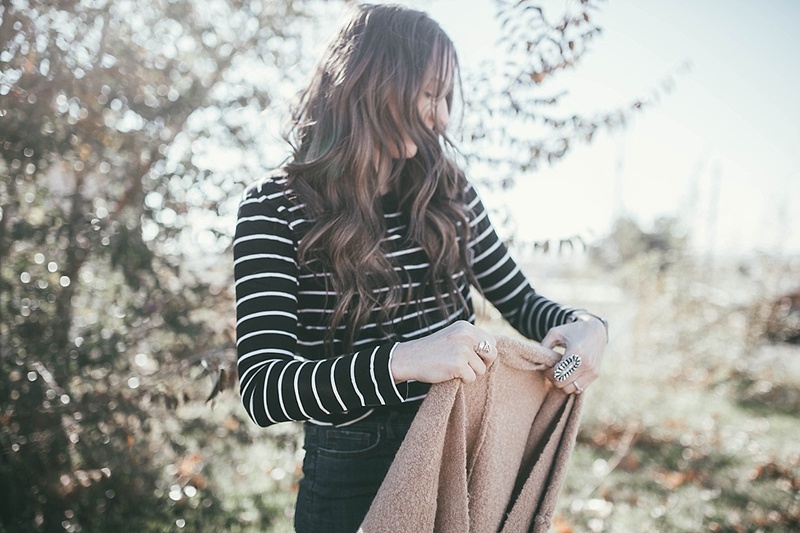 I love that I can layer up, pair my favorite basic pieces a million different ways, and just have the cozy feeling. I have been getting tons of questions about what pieces to snag for fall that you can transition to the winter time and still be warm & cozy. When a bunch of you asked me this I was so excited because I love being cozy and it is one of my favorite ways to dress. First off let’s start by talking about where I like to purchase from. Finding somewhere with a big variety in products and a large range in prices is something super important to me. I like to be able to spurge every once and awhile on classic pieces, but also love to save on pieces that are more trendy or are pieces that I know I will only want to wear one season. 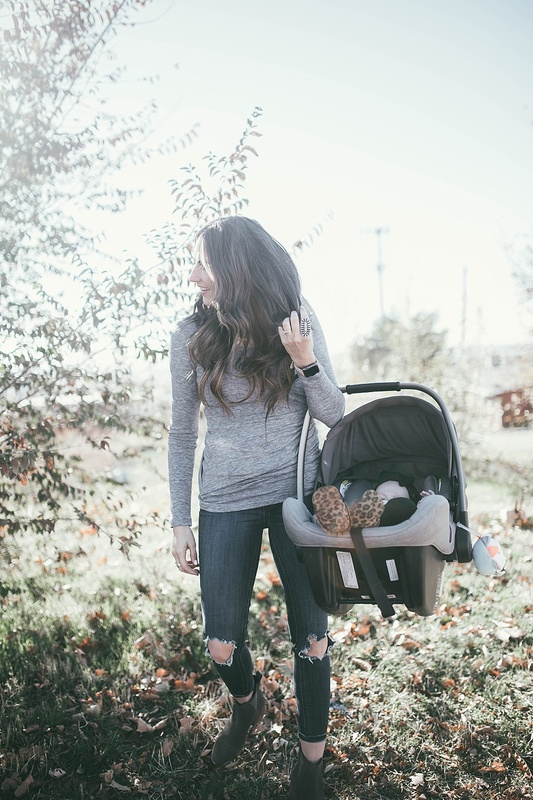 Basics are something that I personally like to save on because I know I will be wearing them every day and that my littles will be getting them dirty. I don’t want to pay a ton of money for a basic tee that I am going to have to replace from #momlife next year. Nordstrom has that all. Often times I hear people say “I can’t afford Nordstrom”, and it makes me sad! 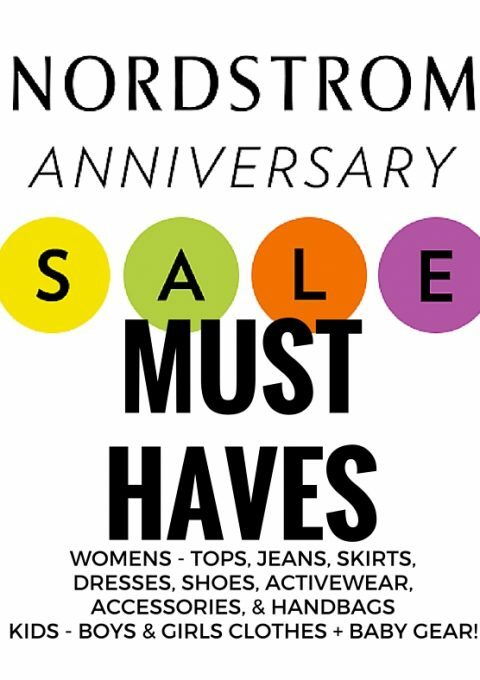 You just have to know what you are looking for at Nordstrom to find killer deals (even regularly priced too) that are just a little bit more than buying at a grocery store. – Free shipping ALWAYS & FREE return shipping too (with no minimums)! If it doesn’t work for you, slap that pre-paid shipping label on the box and send it back on its way with no stress to you! – It is the perfect place to buy gifts because if they don’t like it, they can return it and it is no big deal at all. – Buy online and pickup in store. Do you know exactly what piece you are looking for but don’t have the time to search the store looking for it? You can buy it online & pick it up in the store. Perfect for last minute gift buying too! – Their return policy is truly amazing, Zach had a pair of shoes he wore and after a few wears the soles started to peel. He took them back and no questions were asked, they fully refunded them and he was able to get a new pair. Was it Nordstroms fault the shoes peeled? Nope, probably just the luck of the draw for us. However, they took full responsibility and took care of us. – I can one stop shop for every single person on my Christmas list. Mother in law? DONE. Neighbor gifts? DONE. Brother that you never know what to buy for? DONE. Best friend who has everything? DONE. – You can buy gift cards in the store, online, or even e-gift card someone. A friend of mine would e-gift card each other gift cards back and forth to Nordstrom when we were having bad days. She lives hours from me so it was an easy and thoughtful way to let her know I was thinking about her. 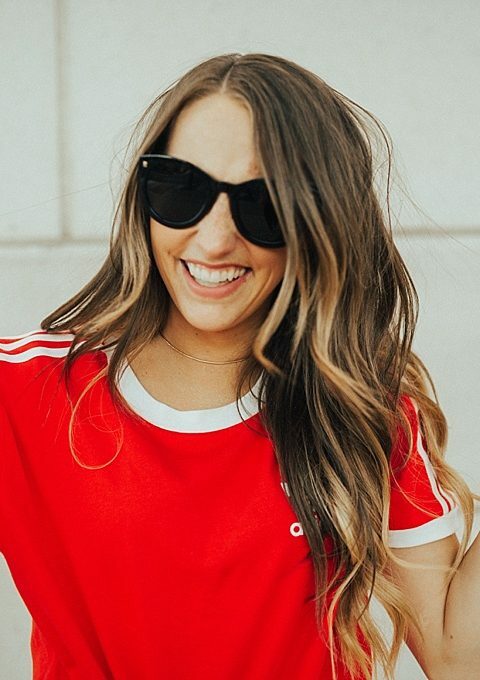 Okay, let’s chat now about basics that are the perfect gift for yourself, mom, best friend, sister in law, etc. First I want to start off with a favorite piece of mine that is really affordable. 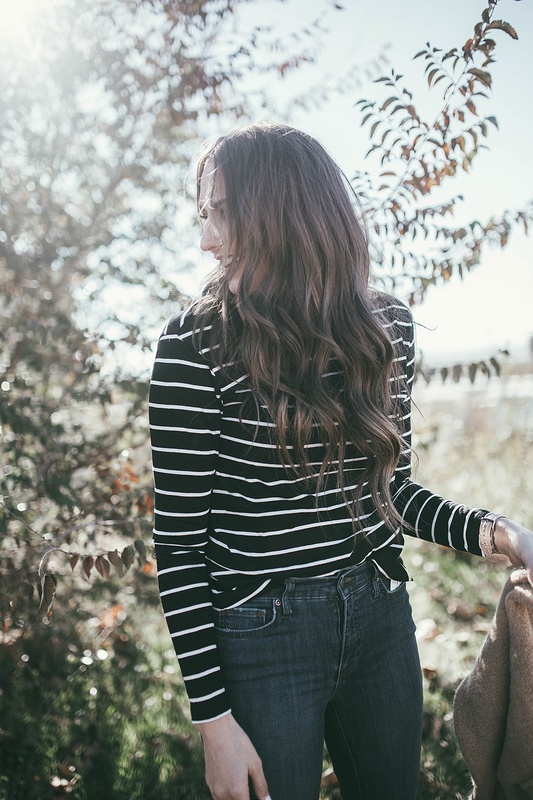 This stripe tee is a favorite of mine to the point that I own it in multiple colors. It can be layered under so many different things for a cozy/warm look and is amazing worn alone for the fall. It is only $19 regularly priced and is on sale for only $15.20. It isn’t too thick, but thick enough to not be see-through. It is the best tee ever and I’m not sure how anyone could not like it. I snagged one for my sister in law for Christmas and my mom too. Jeans are something that I love to buy when I find a good pair, however usually the “good pair” is really expensive. Free People jeans are something that I am obsessed with. Don’t let me scare you away with the words Free People because I know that Free People runs a bit more expensive than other brands, HOWEVER, their jeans are so crazy reasonably price. They are $72 a pair and so comfy. They have a little bit of stretch too them which I love but also don’t stretch out after wearing them multiple times. I also love with this pair that they are mildly distressed only in the knees which is something I feel like I struggle to find. I will say that you will want to size up in them! 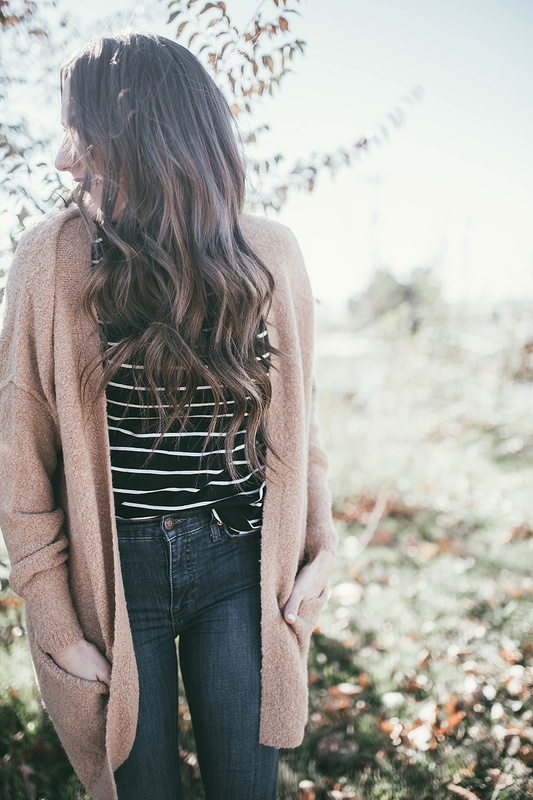 This cardigan is stunning. It is my splurge of this outfit and worth every single penny. It is Free People also and truly the coziest cardigan that I know I will be living in this fall & winter, mark my words on that. It has pockets on both sides which is game changing. It is the perfect fit of oversized and still flattering. 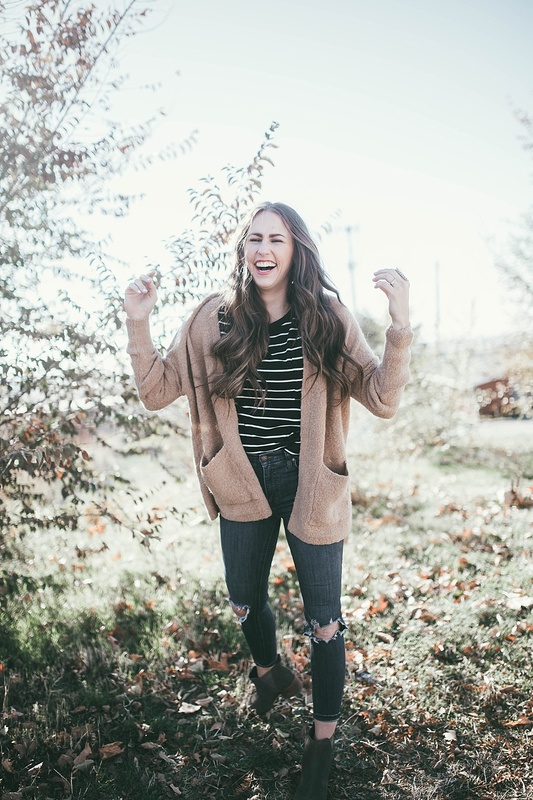 This cozy cardigan will pair over so many different things including basic tees (like the stripe one above) dresses, sweaters, etc. It is a splurge for sure, however it is something that will last you season upon season in your closet. Flattering basic tops are another favorite of mine, I love that I can toss them on with jeans and some booties and they look put together. This top with its ruching across the front is perfect to hide what you want it to. 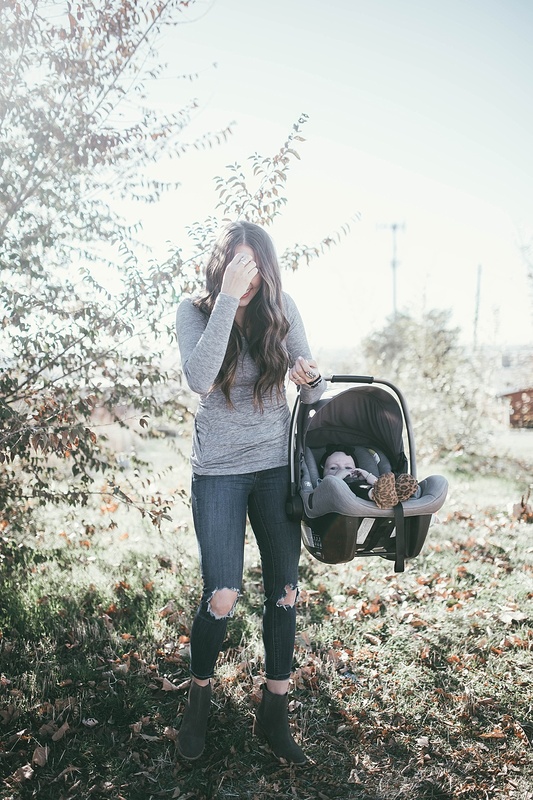 I wish I would have had this for postpartum with Lettie babe. 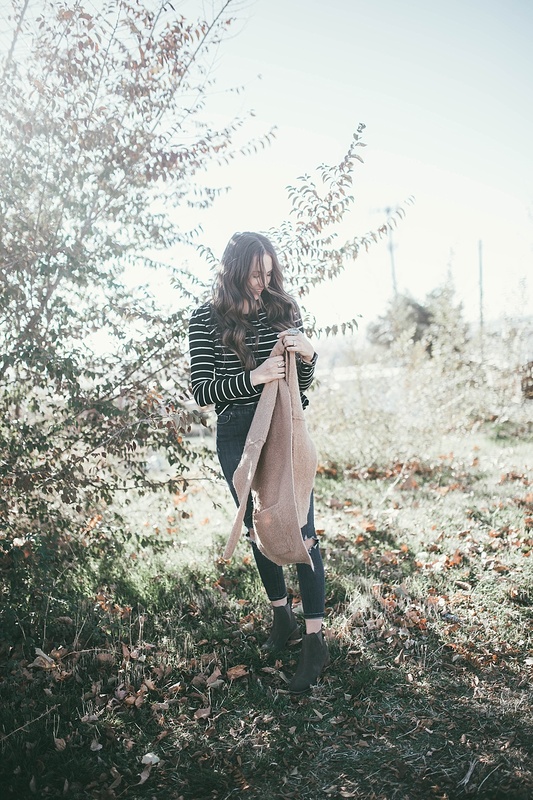 It is buttery soft & it will pair on its own like I am wearing it here or you can layer it under cardigans, a military style jacket, leather jacket, or even a denim jacket! 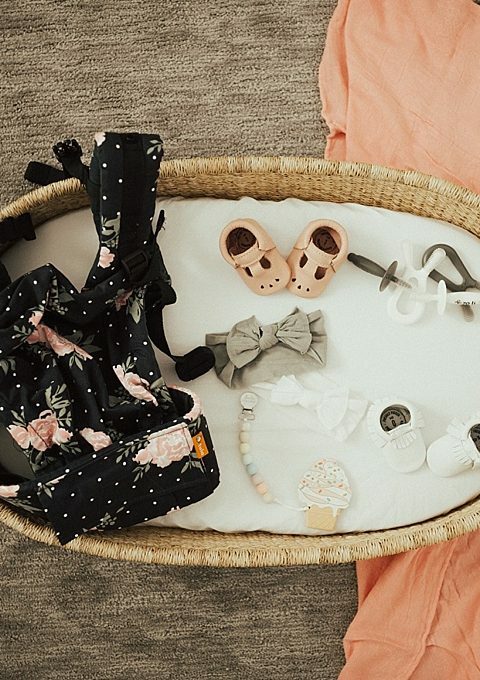 Let’s chat now for a second about baby basics that you can give to your little one or to a new or expecting mama that you know. I am all about spending just a little bit more (especially when I can get something on sale) for something that is better quality. 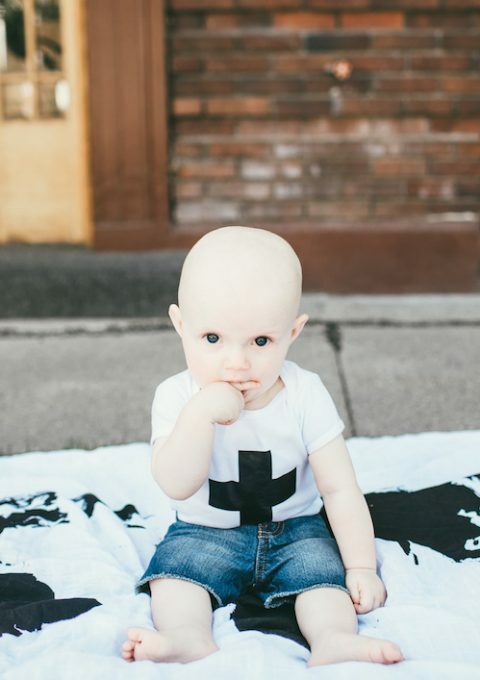 I want to buy classic baby pieces that one baby can wear, I can store and then the rest of my littles can wear/use it too. While I might be spending a little bit more at the time, it will save me money in the long run because multiple of my kids will be able to use that item. 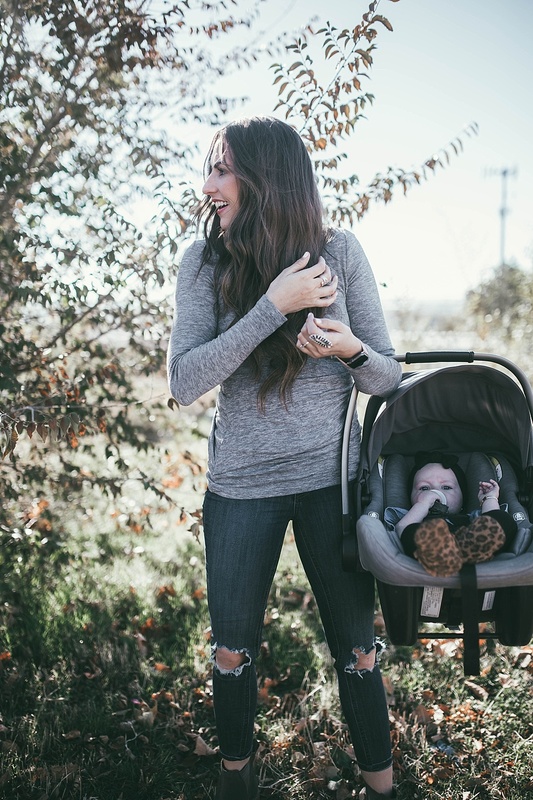 We bought our Nuna infant carrier carseat from Nordstrom for Lettie and bought King’s booster from there too. We did this because we knew if we had a problem with them at all that Nordstrom would help us out. We are obsessed with both of them. I don’t know if I will ever use another carseat company ever again. I know they are going to hold up for multiple kids and that we will still love them even then. If you are going to splurge on someone a baby gift, I can’t recommend a Nuna carseat more. Plus if you buy it at Nordstrom and they want something different they can easily swap it or get a refund. Baby shoes, oh give me all the baby shoes. I think you all know by now that I am completely obsessed with Freshly Picked. They are the only shoes that I put on my babies and to be honest that King will wear at all now. They hold up amazing and Lettie is wearing so many pair that King wore. I love that King wore his moccs through puddles, mud, etc. and they clean up so well that you wouldn’t ever know. We have their diaper bag and you all know how obsessed I am with that. It is the best and so crazy functional. We can’t rave enough about their products and they are worth every penny because of the amazing quality of them. Bows, oh little girl bows. You babes know how obsessed with bows I am. Nordstrom has a huge assortment of baby bows, but my all time favorite and I’m sure you know exactly what I’m going to say is Baby Bling. We are smitten with them and they hold up amazing. My favorite part of them is that I can wash them in the sink if they get dirty, lay them flat to dry, and then re-tie the knot and it looks brand new again! Love this post! And these photos are gorgeous!